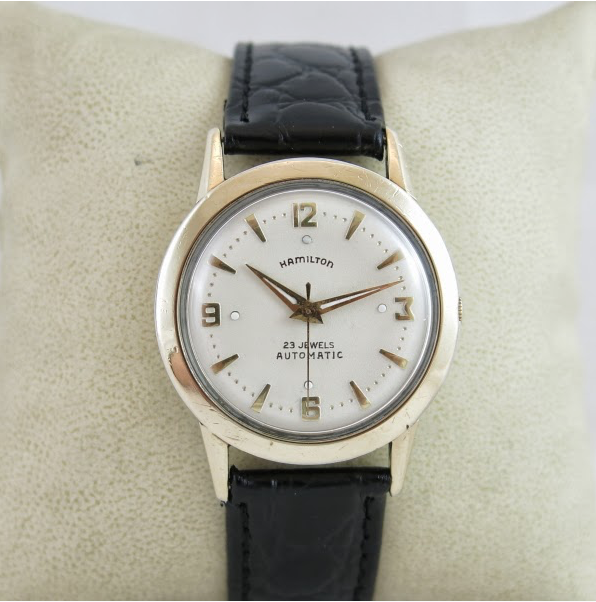 I find it interesting that the vast majority of Hamilton's automatic watches fell into three families… the Accumatics, the Automatic K's and the Thinomatics. However, there are two groups of models that constitute just a handful of models… the Kinematic, with two models and the Rotomatic, with three models. 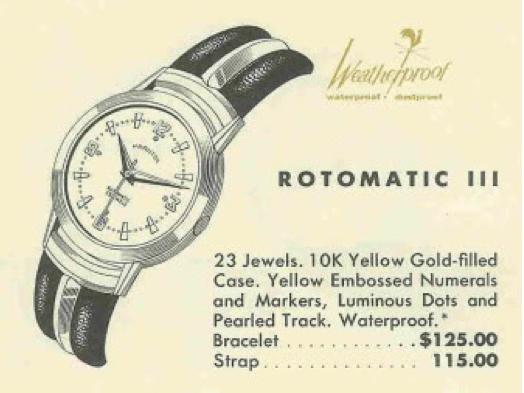 The third watch in the Rotomatic line is the 1958 Rotomatic III. It was produced for only two years. The Rotomatic III comes in a 10K yellow gold filled case. 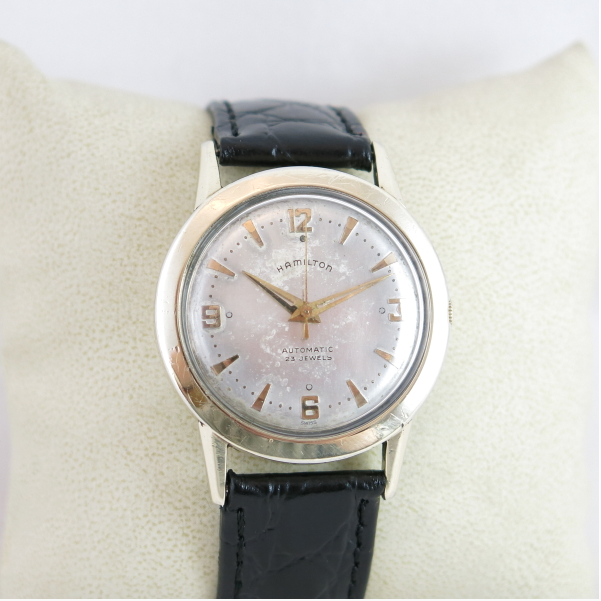 The silver dial has yellow embossed numerals and markers along with luminous dots at the 12,3,6 and9 positions and a raised pearled track between the markers. 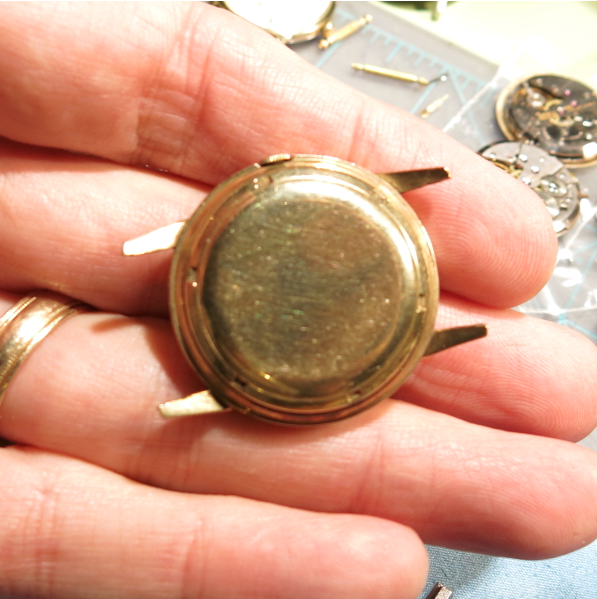 The crown is semi-hidden and recessed in to the case so it's not easy to wind by hand - but it's an automatic so it winds itself while you wear it. Unlike the vast majority of model, the Rotomatic line also said "23 Jewels" on the dial to indicate that is had a special movement inside. 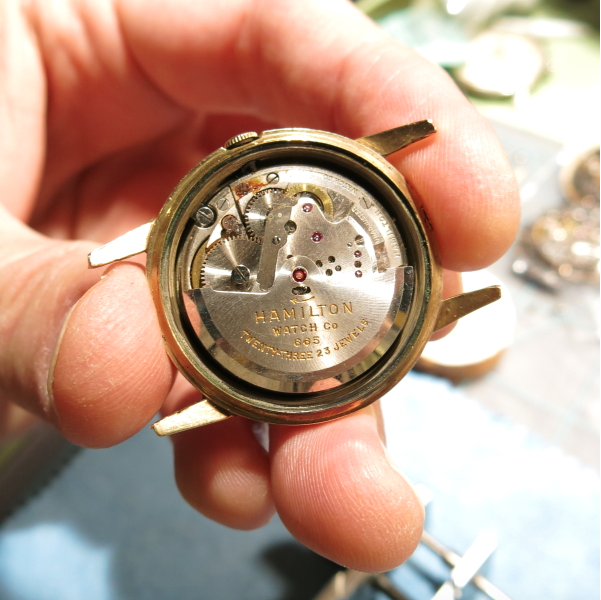 Under the hood is a 23 jewel, Swiss-made Hamilton 665 movement. I recently purchased a Rotomatic III in serious need of love. It would run only for a few seconds. 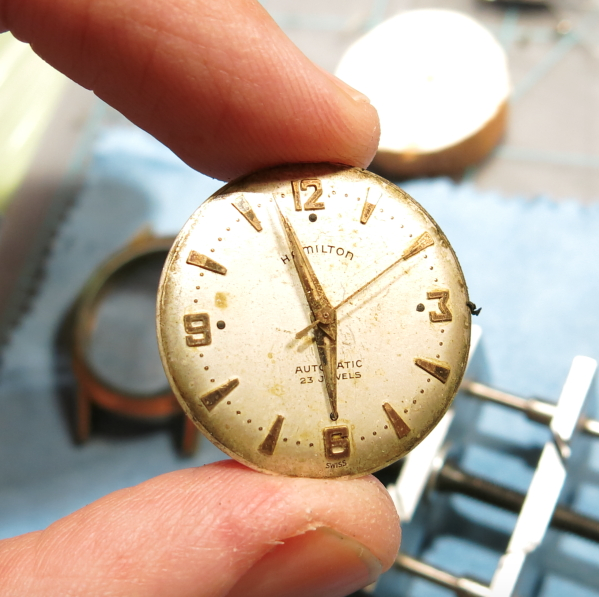 Crystal was beat beyond polishing and the dial was very dirty. The 10K gold filled back screws on and off and has a gasket under it to keep moisture out. With the back removed, you can see that the 665 is very similar to the 661, which was used in most of the Automatic K-series watches from the same time period. It was made by Kurth Freres (Certina). It's pretty dirty but the only thing that really concerns me is the rust on one of the train bridge screws near the crown - a little water has gotten in there. Hopefully the keyless works is still in good shape. The dial is really dirty. The lighting in my shop makes it look nicer than it really is. I'll try to clean it up the best I can. Well, a thorough cleaning restored the movement back to running condition. The rust that I saw inside was easily removed and limited to only that one screw head. With some fresh oil it now runs great. 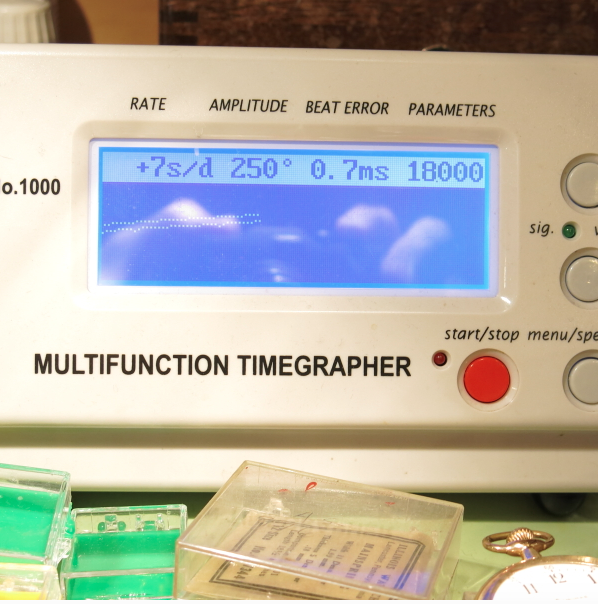 A new crystal reveals that my dial cleaning didn't go so well. I didn't lose the printing but I did lose a lot of the finish. It's now a very raw-silver color with a little splotchy-ness in the center. This really underscores what I call, "HandyDan's First Rule of Holes" - once you know you're in one, stop digging. 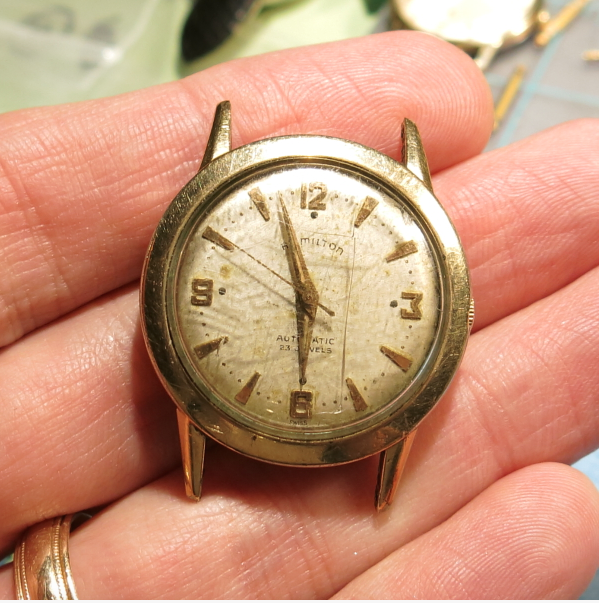 I'll probably get this dial refinished. Hopefully it can be redone to look better than it does now. It's a fairly complicated dial to redo with the unique printing and the raised pearlized track. With a better dial, this watch will look as good as it runs, and it runs great. UPDATE: I decided to get this dial redone and I sent it to Eagle Dial - a refinisher I had not used before. I wanted to see how they would do with the pearled track and unique dial pattern. As you can see, they did a pretty good job with everything but the printing. My main objection is 23 Jewels is on top of Automatic instead of beneath it. Plus the font is slightly off since it's serif instead of sans-serif. But on the whole it was a dramatic improvement and I was pleased with the results. I picked up a Hamilton Automatic grade 664 25J. Movement it's to bad they had Scraped the Astramatic 14K. Gold Case !!! Yeah, I saw that movement. Sad. I hope they enjoyed turning a $900 watch into $200 cash. Just a typo heads up. Paragraph 4, Hamilton became Hamitlon. Beautiful work btw. Popped in to look around after running across a 664 movement in a group of parts I acquired. Sadly it’s all alone, not case to accompany it.